Choosing a toilet should not be complicated. 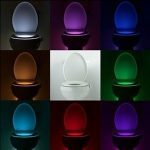 However, each toilet and toilet manufacturer will have different features and different prices. Some flush quietly. Some handle flushing and other things automatically. Some are basic toilets that only promise to flush perfectly. 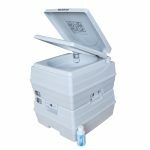 One example of a great toilet, simple toilet is the TOTO Ultramax. 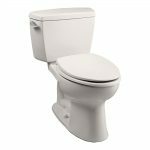 To learn more, you should read our TOTO Ultramax ADA toilet review. One of the best features of the Ultramax is that it is ADA approved. This means that it has a higher than normal seat height to be a great toilet for anyone with disabilities. The bowl rim is 17 1/4 inches from the floor. That puts the seat up near 18 inches. It is also referred to as "Comfort Height" or "Universal Height". It is an elongated toilet bowl. 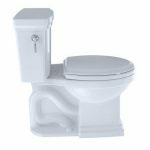 You can choose from cotton white, Sedona beige, colonial white, and bone colors to give you a bathroom toilet that complements your bathroom decor. The way it looks will be further enhanced by its simple, elegant design and finish. Regardless of which color you choose; you can be sure that you will find a large water surface once it is installed. 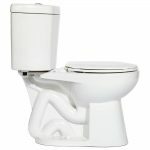 It is a toilet that is made in the USA and meets all specifications for a toilet that our states require. 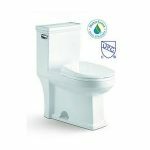 This includes a 3-inch flush valve and a larger 2 1/8 inch trapway. The trapway has been computer designed to effectively flush out all waste quickly. 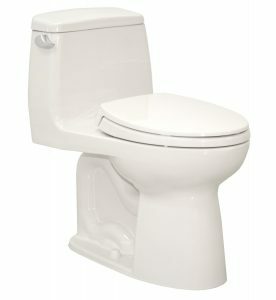 In fact, with this toilet, you can expect commercial grade flushing that is quiet enough to be in a home environment. For a one-piece toilet, the Ultramax is lightweight. Whereas most toilets weigh 100 pounds or more, this one weighs only 98 pounds. This ensures an easier installation for anyone attempting to install it alone. This toilet uses pressure to flush out waste and toilet paper. This means that it is effective at flushing, but it also ends up being a little loud if you are flushing in the middle of the night. Most owners do not seem to mind. They say that it flushes out well and most have never had an issue with it clogging, even after years of use. For this reason, it has earned a star rating of 4.5. 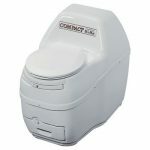 This is pretty good for a toilet and most owners say that it is the best toilet they have ever owned. Many bought it for the simple fact that it is a TOTO toilet at an affordable price. Negative reviews are available for this toilet as well, though there are very few. Most of the negative reviews state that it clogs easily and became defective after a short time. This proves that not all people love the Ultramax, but it kind of makes you wonder what went wrong with their toilet when so many other people are very happy with the way this toilet functions. Either way, the height makes it worth considering for the people who have trouble getting up and down when in the bathroom. 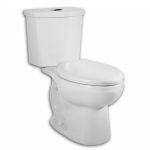 If you are ready to forget the double flush, but worry that a low flow 1.6 GPF toilet will not get the job done on the first flush; rest easy. This toilet is able to take down some pretty serious waste according to most owners. It looks great and has very high owner ratings The only thing that it is missing, in our opinion, is the SanaGloss coating that is commonly found on the best TOTO toilets. 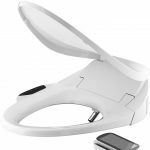 The SanaGloss ensures a cleaner bowl after every flush and also ensures that the toilet will always have a beautiful shine. 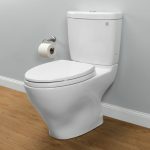 If you can live without the SanaGloss, you should be able to live with this toilet in your home and feel comfortable sitting or standing up from the Ultramax.